After 'Forty Years Of Pointed Ears,' 'ElfQuest' Ends Its Legendary Run ElfQuest is a comics industry institution — this saga of, yes, elves on a quest has been running since 1978. But now, creators Wendy and Richard Pini have brought the quest to an end. Cutter Kinseeker, chief of the Wolfriders, and his lifemate Leetah. ElfQuest is something unique in the world of comics: It's one of the longest-running fantasy series ever — and it's been the passion project of just two people for its whole life. There were few comics shops, fewer conventions, and not a lot of women were making comics when creators Wendy and Richard Pini began their epic quest in 1978. But now that quest is over, and they're on a farewell tour called Forty Years of Pointed Ears. 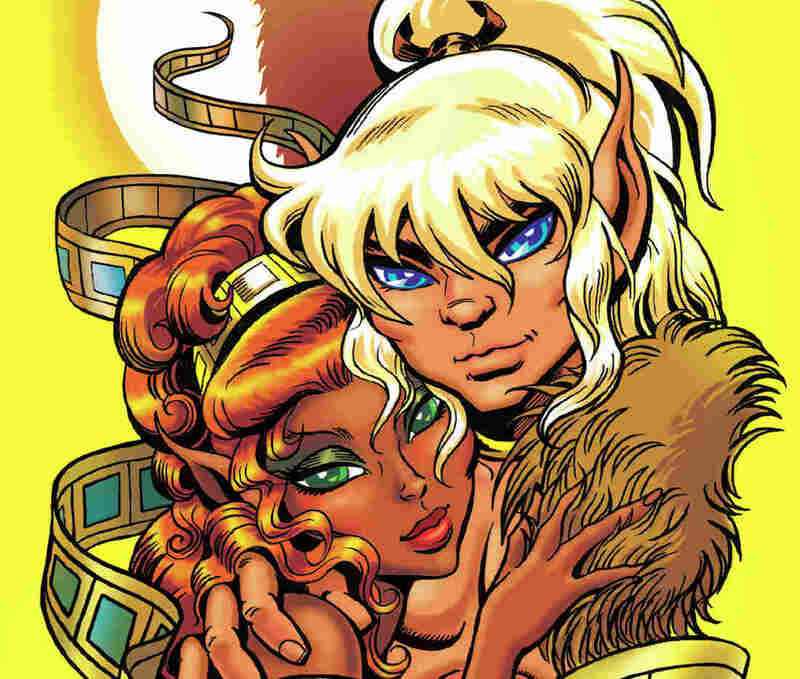 ElfQuest is an old-fashioned comic. It isn't dark, it isn't gritty. It is what says on the cover: A four-decade saga about elves. Elves with big eyes, bigger hair, and really great abs. On a quest. "The quest is to find out who this race of beings are," says artist and co-creator Wendy Pini,"where they came from, and how they can best fit into this world that they're on, that is not their true home." Cutter Kinseeker, chief of the Wolfriders, is the central character — and it's his quest for home and community, his hero's journey, that drives the story. It's easy to snark about the hair, the abs, and how incredibly earnest Cutter and his kin can be. But the comic is utterly addictive — start flipping those vintage black and white pages and you won't stop. And a lot of that is down to Pini's art, influenced by her love of Marvel Comics legend Jack Kirby and Japanese artists like Osamu Tezuka. "Tezuka ... he is considered the Walt Disney of Japan," she says. "He created Astro Boy, Kimba the White Lion ... and from Tezuka I learned the line of beauty. It's a curving, sweeping kind of line that you see throughout Asian art that is so aesthetically, spiritually soothing and beautiful. And to take this soothing artwork and then apply it to action scenes where the characters are just literally going through hell creates such an amazing tension." Pini was already a working fantasy illustrator when she started drawing ElfQuest. It was 1978, and the time was right: Star Wars was huge, Lord of the Rings was on everyone's shelves, so a comic about elves seeking a home on a planet not their own seemed like a sure bet. But there was just one problem: How do you get your comic into people's hands when there are hardly any comics stores? 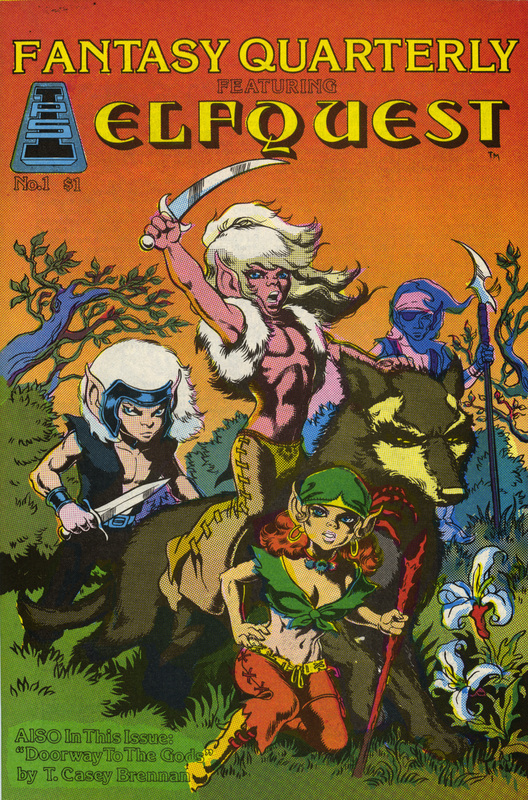 The very first issue of ElfQuest, from 1978. Greg Bennett is the co-owner of Big Planet Comics in Bethesda, Md. — and an ElfQuest fan — and he says that when the Pinis first started making the comic, modern distribution systems just didn't exist. "That's daring as heck, because there was no way to get that stuff out there then other than to go to conventions, sell it yourself, go store to store to store and hand sell it. The hand-selling worked; ElfQuest took off. In its 80s heyday, the Pinis say it was one of the first comics to make it into mainstream bookstores. These days, ElfQuest fans can be a little harder to find — it's mostly a word of mouth kind of thing. But luckily for me, we have one here at NPR: Morning Edition supervising editor Melisa Goh. "Everyone has a story, a movie, a book, something that was very influential in their lives at a young age, and ElfQuest was mine," Goh says. 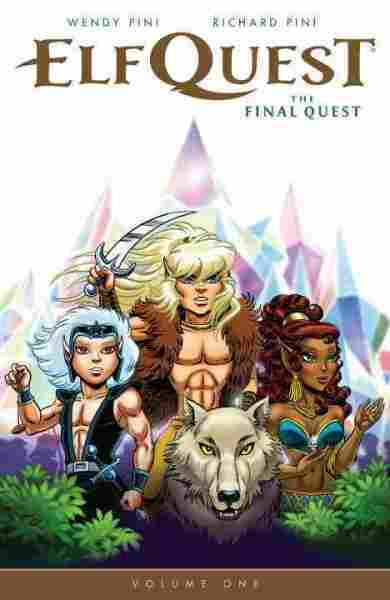 "There is a community aspect to ElfQuest that I liked a lot. The idea that you were looking for your own kind, so that you can take community and shelter and solace in each other." Goh has loved ElfQuest since she was 11. She loved it so much, in fact, that she invented her own character. "Her name was Triller. She wore blue. She was a musician, which was a little bit risque in the elf world that I had in my mind, because if you're an ElfQuest elf you know that — 'in the trees, as you please, on the ground, not a sound,' so my character was a bit of a rebel because she liked to play music." It was actually kind of hard for me to pry that information loose, because Goh says she's still traumatized about being teased for reading ElfQuest as a kid. Comic shop owner Greg Bennett says that did happen — ElfQuest was always a little outside the mainstream, and its fans were mostly women at a time that women weren't reading a lot of comics — so he sometimes had to deal with trash-talking customers. "And as a comic shop owner any time I heard somebody doing that I would always, first thing I would say is, well, did you ever read ElfQuest? And they would always say, well, no — I'm like OK, well, after you go read it, go read those first 20 black and white magazines, then come back and tell me ElfQuest's no good — and any one of them actually took me up on it said oh wait, you're right. This is really good." The last storyline — appropriately called "The Final Quest," wrapped up earlier this year, 40 years to the day after the publication of the first issue. The Pinis aren't abandoning the elves completely — they're going to allow other creators to tell stories in their world. But they're pretty close-mouthed about what's coming next. "We know what you want to know. So we're focusing on that," Wendy says. "There are two strong threads, and the fans just want those threads spun out," Richard adds. "I know, but we're not going to cater to them," Wendy chimes in. "We don't know — just because we know what the fans want, doesn't mean we're going to take the story that way." If you want to join the quest, the early issues are available for free online.